Jonathan Lethem: Excerpt from a Live Career Retrospective, hosted by Richard Wolinsky. 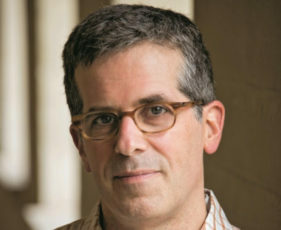 On March 3, 2016, Richard Wolinsky had a chance to sit down with author Jonathan Lethem in front of a Berkeley audience as a benefit for KPFA. Jonathan is the author of several novels, including Motherless Brooklyn, Fortress of Solitude, Chronic City and most recently Dissident Gardens,along with short story collections and a book of essays, The Ecstasy of Influence. This except from the interview focuses on Jonathan’s early career, living in Berkeley and working at Pegasus Books and Moe’s Bookstore. Jonathan’s collection, Lucky Alan and Other Stories, had just come out in trade paperback.His newest novel, A Gambler’s Anatomy has a release date of October 16, 2016. Special thanks to Bob Baldock, who creates these events, and Jane Heaven, who records them. Recorded at the First Congregational Church in Berkeley. The full 70-minute interview can be found as a Radio Wolinsky podcast.